I really like Fleischmann’s yeasts site, Breadworld. They have many tested recipes and I have never had one of their recipes fail on me. So, when I was going to a friends for wine and wanted to take a treat that would travel well. I went to their site. 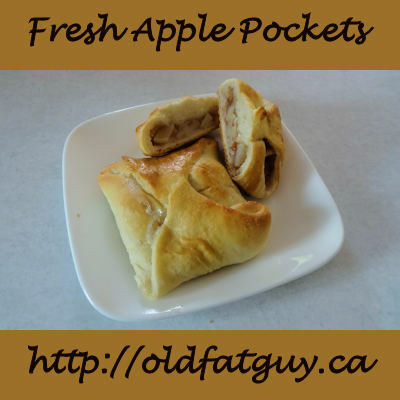 I found a recipe for Fresh Apple Pockets and gave it a try. I started by peeling and slicing the apples. I did depart from their recipe a bit. I put all the flour in with the yeast, sugar and salt in my stand mixer bowl and stirred them together. I put the water and butter in a microwave safe bowl and heated it to between 120 F and 130 F. The butter is not melted. I put the water and butter in the mixer bowl and attached the dough hook. I mixed until the dough started to cling to the hook. Then I continued kneading for 7 minutes. I covered the dough an let it rest 10 minutes. In the meantime, I mixed the apples, sugar, flour and cinnamon. I divided the dough in half and rolled one half out to a 10 inch square. I cut the square in quarters and put 1/8 of the apple filling on each square. I pulled the corners together and pinched them together. I repeated this with the second half of the dough. I put the packets on a cookie sheet I had sprayed with baking spray. I covered them with a dish towel and let them rise until doubled. That took the full 40 minutes as it is cold here in the mountains. I heated the oven to 375 F.
I mixed the egg and water together and brushed the packets with the mixture. I sprinkled the top of the packets with sugar. The instructions say to bake for 20 to 25 minutes until nicely golden brown. It took me about 23 minutes. I let them cool on a wire rack. These are very tasty. The bread crust has a nice chew, there is a good apple taste and they are sweet but not overly so. They are a nice change from a regular apple turnover. Also, the bread crust means they travel well and aren’t too delicate. They would be perfect for a lunch box or a picnic. Yum! Such a crunchy treat, David! I could easily eat them for breakfast with a cup of tea. Can’t wait to give them a try! Actually, they are softer and breadlike! Sort of a sweet dough. I hope you like them!